Here's another shot of Turret Arch shot seen through North Window. I wanted to do something really different and decided to shoot at night, hope for snow, and use a combination of moonlight and flashlight. I thought: night shot + moonlight + stars + snow + flashlight = not very likely to have been shot before. There was only a very small window of time to do this, because I wanted a low moon and it needed to rise at a certain angle or else there would be large shadows of the rocks behind me creeping into the shot. 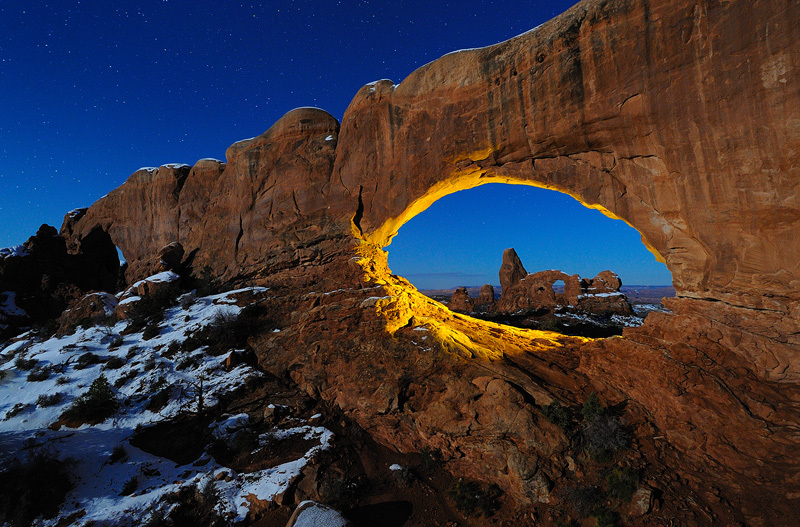 The inside of the arch was light painted during the exposure.